Don’t be fooled by the name Trash! This is the easiest, tastiest treat you can make in minutes! Open your pantry, add ingredients, cover in white chocolate. 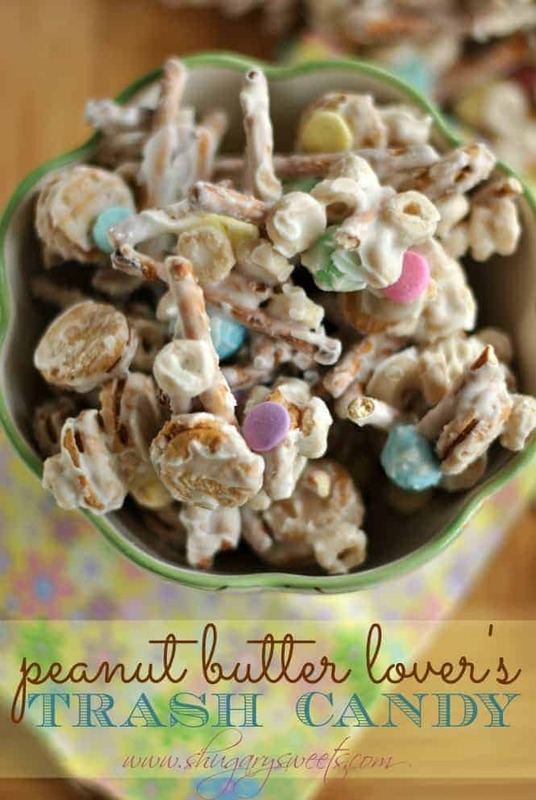 This Peanut Butter Lover’s version includes Nutter Butter Bites and Reese’s Pieces PB eggs! 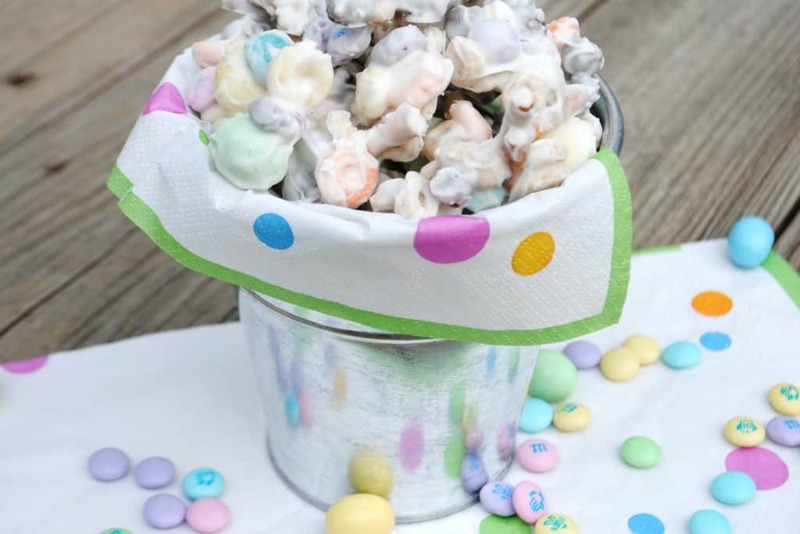 Have you made trash candy before? Okay, the real name is White Trash candy. That’s so wrong, right? 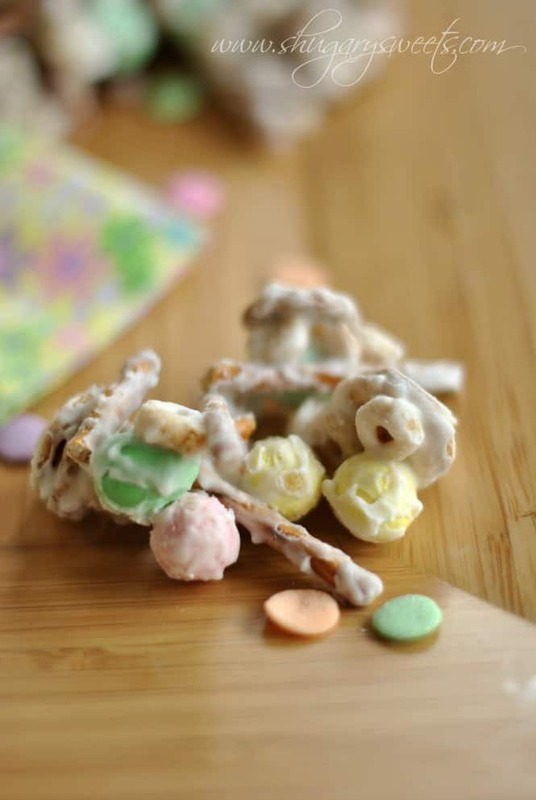 This candy is so easy and versatile to make. I’ve said it before, but my kids eat a lot of cereal. And there is always a cup of cereal left in the bottom of the containers or bags that nobody eats. I think they are afraid if they pour the last of the cereal in their bowl, they will get the crumbs too. I think the REAL reason is my kids don’t want to be the one responsible for breaking down the box and putting it in recycling. I am on to them! But maybe. Just maybe they know deep down if there is cereal left in those boxes I will combine it with some candy and pretzels and cover it in white chocolate. Yep, that’s how White Trash Candy is born. Seriously…just add whatever you already have in your pantry. It makes a HUGE bowl too, so it’s perfect when you have company over and don’t feel like making treats. 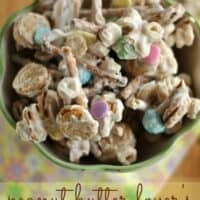 Just whip up a quick batch of this Trash Candy. 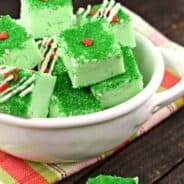 And of course I am such a sucker to the seasonal aisle in the grocery store, so I always have some fun Holiday candy to toss in! This would be cute for Easter too! Want more Trash Ideas? You came to the right place…. This Bunny Chow from last year used Oreos and Milk Chocolate m&m Candies! Another irresistible combination! 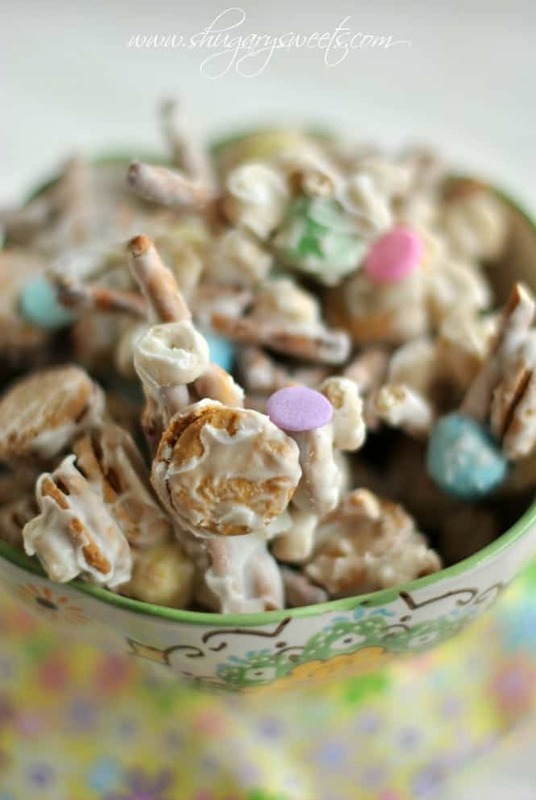 The original White Trash Candy recipe on my blog…incorporates cereal, pretzels and candy! 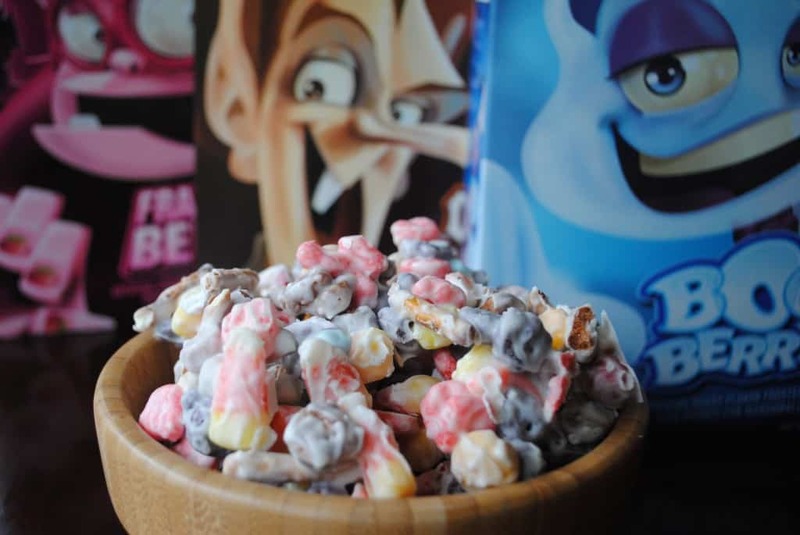 Halloween Trash candy made with those specialty cereals, candy corn and more! Save this one for later! Don't be fooled by the name Trash! This is the easiest, tastiest treat you can make in minutes! Open your pantry, add ingredients, cover in white chocolate. This Peanut Butter Lover's version includes Nutter Butter Bites and Reese's Pieces PB eggs! In a large bowl, combine all dry ingredients. Pour melted white chocolate over everything and stir gently. Pour onto a piece of parchment paper to set (about 15 minutes). Add sprinkles if desired! I love recipes like this. I’m always finding a bag of cereal, pretzels, or cookies that only have a little bit left. Not enough for a snack but too much to throw away. So I pull what your kids do and just let it sit there haha. Now I know exactly what to do with it! 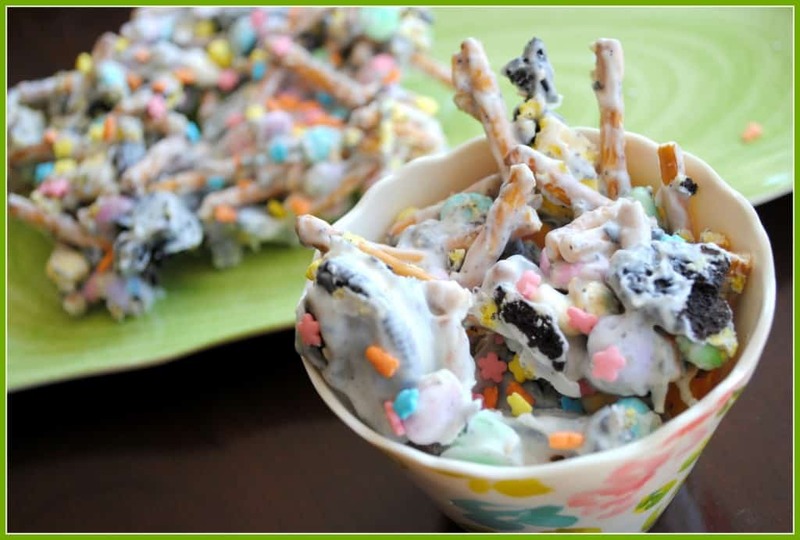 Love that you can make this with so many different snacks and candies. And you cant beat how easy and quick it is to make. 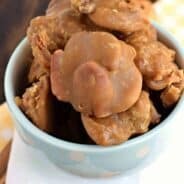 I think this might be one of my new favorite recipes! That’s how this recipe was born in our house…using the leftover cereals! Enjoy Elaine! Gotta love a fast and easy recipe like this…and that cleans out odds and ends. And where PB & white choc are the stars! Oh goooodness. I am such a pb lover and I am alllll over this white trash candy!! I have not made trash candy before! So that is what you do with the left over cereal! Finally a purpose for it! Yes, don’t throw it away!!! Sounds like the perfect snack for peanut butter fans! What? You act like it’s weird to bark orders at photos of food? Nope. Not weird at all. I totally get it! This is perfect! I love recipes like this that make use of all of the half-empty bags in the pantry! yeah me too, especially ones that have candy in the name and take 15 minutes! thanks Elise!! Do you think that peanut butter cheerios would be overkill with it? If i had them, I totally would have used them! I even thought about buying them, but then that would defeat the purpose of using the ends of the cereal boxes! i think they would be delish. I love how it uses up all the leftover cereal in the house – brilliant! It happens in my house all the time and it’s me or my husband that always ends up eating the bottom. I get it though, why they don’t want to, you get all that powdery yuck in your bowl! Yeah, just don’t pour that powdery yuck in the candy! It would still be gross, LOL. Cool.. I haven’t seen this much before. Looks delicious. I LOVE trash candy and this version looks the BEST yet! OMG! I haven’t had this in YEARS!! A coworker used to make it at Christmas, but haven’t had it since. Love the peanut butter version! I think that it is time to change, and make it for yourself this weekend!! Candy that takes less then 15 minutes to make?! I am totally in. Plus I always have leftover cereal. I love your Trash Candy! This is amazing, as always Aimee! I make good trash, LOL. My mom would be so proud 🙂 thanks Dorothy! I have never made any trash/white trash candy before. But I love how you clean out the pantry with this candy. Kind of like what we do at home with leftover potatoes and veggies we make bubble & squeak. And when I clean out the cupboards at home there is always like 3 or 4 bags with roughly a cup or so just sitting there. This is the perfect way to use it up! Thanks Elizabeth, I love the name Bubble and Squeak. I’ve never heard that before!!! Most people in the US haven’t its an English thing 😉 You should try it one time its great! Holy cow, this wouldn’t last 20 minutes in my house! So simple, and it sounds ridiculously good! White trash never looked so good. I’ve never made anything like this. Time to get trashy! LOL, your comment is awesome. Time to get Trashy! LOVE IT. of sugar consumption and diabetes. This is exactly what I want for my sugar cravings-thats why I’m here! Love the line about your kids and the cereal boxes…so true! I’m totally in the mood for trash now-and 7:30 am! Thanks Aimee! 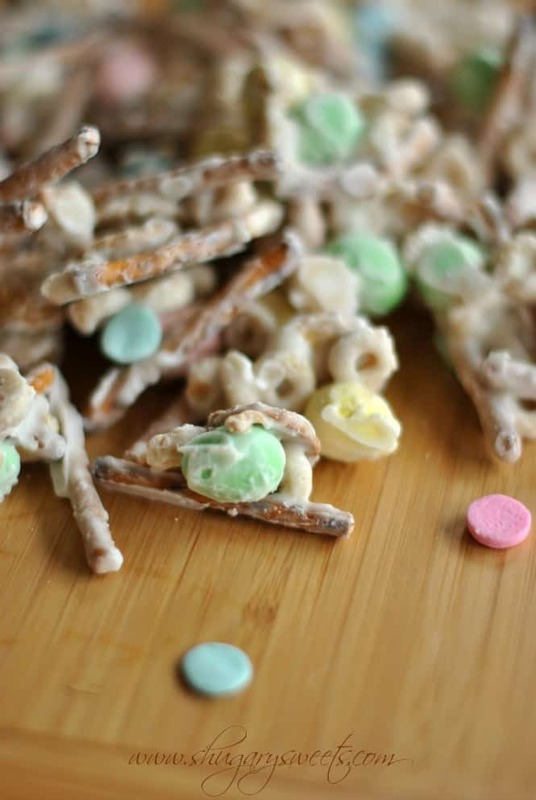 Such a quick and easy to way to use up all the scrap cereal and candy bits– great idea! I’m loving the pretzels in this candy!! Especially since I love eating pretzels with PB! Aimee this is the prettiest type of trash I’ve ever seen 😉 and the colors go so well with Easter coming up! Pre-Easter Snackage here I come. This is a better version of kitchen sink pasta! yum. I love trash candy! Kitchen sink pasta? That sounds good too!!! I have never wanted to eat trash so bad in my life lol … yum! This sounds highly addictive! Love it! Are you related with my husband. He NEVER eats the last serving of cereals from the bag and the same for the milk, if there’s less than 1 glass, he’ll open another carton. This trash candy sounds pretty addictive! Not that I know of, but he would fit right in here with my family 🙂 MEN! KIDS! Aaarghhh. That looks so colorful and fun to make! Ha-ha! Love the name! This treat surely looks pretty! Luv this idea! 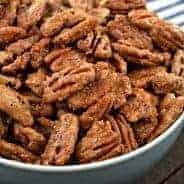 I absolutely dislike the crumbs on the bottom of the cereal box as well since I like my cereal still crunchy but the crumbs turn soggy right away. Perfect for my husband 😉 But using them to make candy treats sounds even better. Oh, heck yeah!!! I love this! I had a similar recipe that I was given about 20 years ago. I could no longer find it so I am glad that I found yours. The only thing is mine was called Sinful Stuff and mine and yours is that it is so Sinful because you cannot stop eating it. I especially like you Peanut Butter Lovers version. Thanks. PS: My youngest daughter’s name is Aimee and I love the spelling of this. We are going to peanut butter lovers trash candy.